POST approved provider; LocalGovU. By clicking on this link, www.localgovu.com/mpoa, you will be directed to their website where you will learn more about this exclusive training partnership and the benefits it provides. 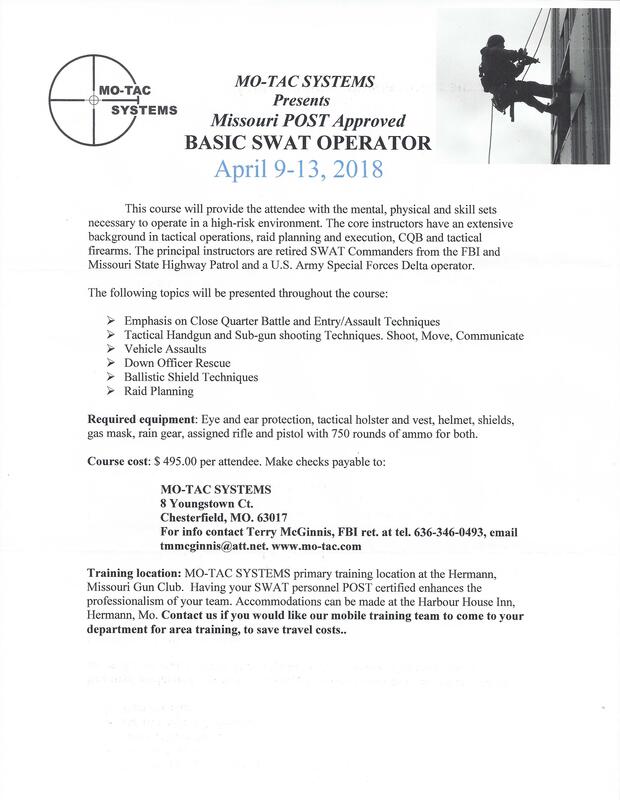 While we have negotiated a few free classes in order to introduce you to this great training, it is still up to you and/or your agency to register you for an account and to review the other wonderful classes, all of which are POST certified and all at a reduced cost due to your membership with MPOA. We thank you for your service to your communities and for your membership in the Missouri Peace Officers Association. We hope that you see the benefit of this on-line training opportunity as we do. And as always, stay safe out there. 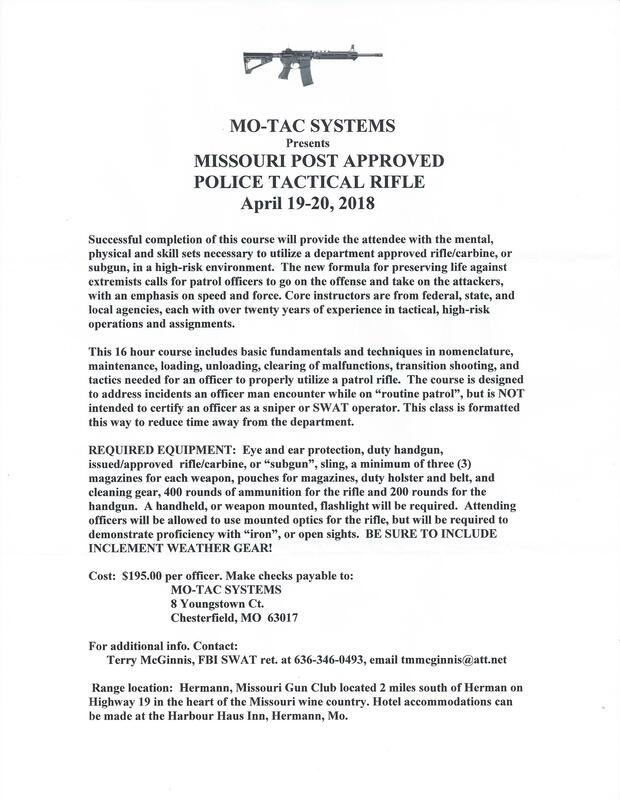 MO-TAC SYSTEMS was founded in 2008 by Terrence McGinnis, a retired 32 year veteran FBI Special Agent of the FBI. During Agent McGinnis's career he was a member of the FBI SWAT team for 25 years holding numerous positions as operator and SWAT team leader. McGinnis's fellow instructors are Bob Rothrock a retired Missouri Highway Patrol SWAT Commander with over 25 years of experience, Jerome Klipfel a retired St Louis City Deputy Commander of the SWAT team with over 30 year's experience, a US Marine Scout Sniper and a recently retired Tier One operator with the US Army Special Operations Command. 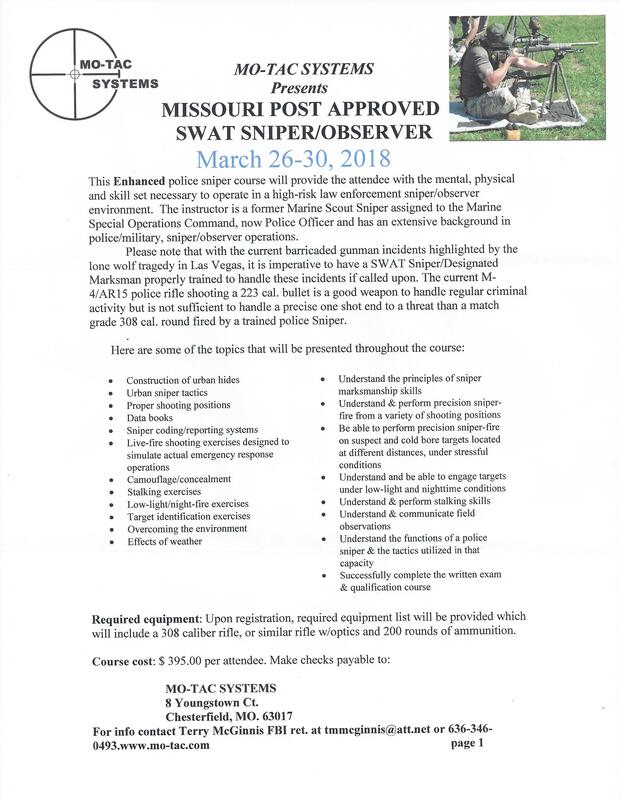 MO-TAC SYSTEMS is committed to providing commissioned law enforcement and corrections officers with excellent low cost Missouri POST approved SWAT training covering Basic SWAT, Enhanced Sniper/Observer and Patrol Rifle. 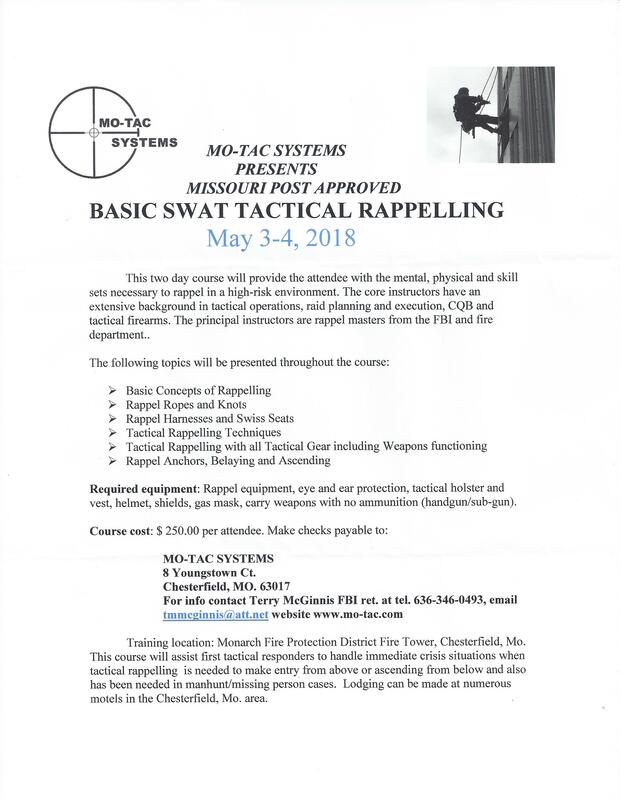 We also offer Basic Tactical Rappelling, Tactical Firearms and Active Shooter. Our training facility is located in Hermann Missouri, in the heart of Missouri wine country. We also have a mobile training team that can travel to sponsoring departments training area to train officers saving money on travel. 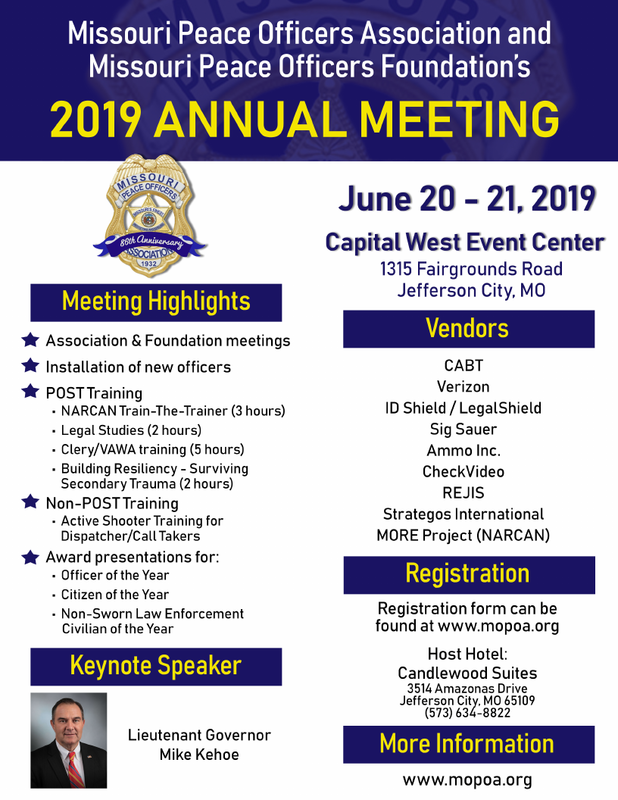 An annual conference co-sponsored by the Missouri Peace Officers Association provides training sessions in current issues of law enforcement to keep members of the profession informed on new procedures, laws and technology. The conference enables members to exchange ideas and encourages cooperation among all groups of law enforcement. A free exchange of ideas and experiences is encouraged to help members in solving local problems within each community. When Missouri's peace officers work together in a cooperative manner our communities benefit and law enforcement is enhanced for the citizens of Missouri. The Missouri Peace Officers Association is an Approved Provider of Law Enforcement Continuing Education therefore training is POST approved. 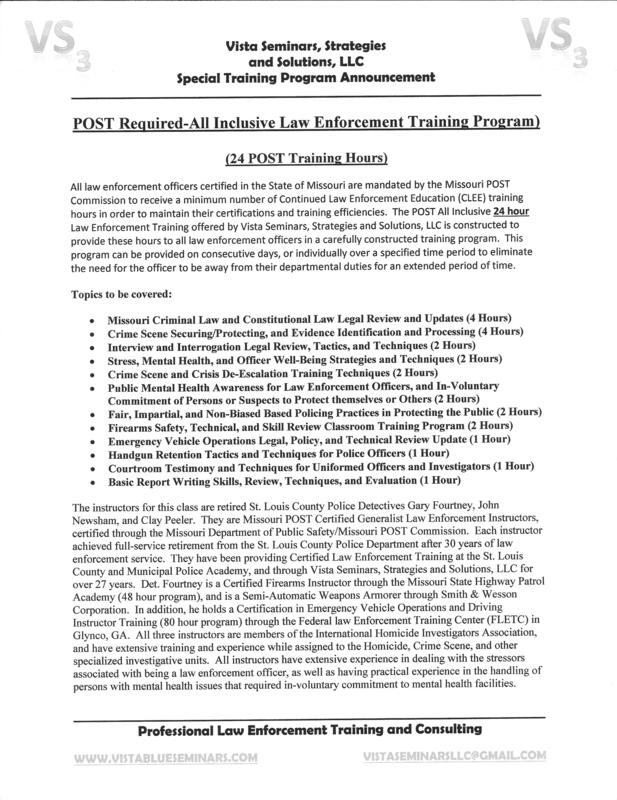 The MPOA training program is provided in conjunction with the Training Committee whose purpose is to promote the proper training of Missouri peace officers. Members of the Training Committee are: Officer Chet Mackiewicz, Sedalia PD (ret.) Chair; Major Richard Gillespie, UCM (ret. ); Capt. Tim Moore, Liberty PD; Chief Bob Ronkoski, St. Charles Community College; and Major Dale Schmidt, MSHP (ret. ).